Whether you are an author investigating where to submit your paper, an editor evaluating your journal’s performance or a librarian reviewing the impact of your investments, it is important to know how journals compare to each other. With the 2014 journal metric values for the Source Normalized Impact per Paper (SNIP), SCImago Journal Rank (SJR) and Impact per Publication (IPP) live in Scopus, now is a good time for evaluation and comparison. All journals included in Scopus receive journal metric values — and the extensive, global coverage of Scopus means you can evaluate any journal’s role in the scholarly publication landscape, regardless of whether or not they are included in Impact Factor assessments. Additionally, over 22,000 serials across science, social sciences and the arts and humanities also receive citation performance metrics in Scopus. Last week, we announced that the 2014 journal metrics values were launched and freely available on www.journalmetrics.com. 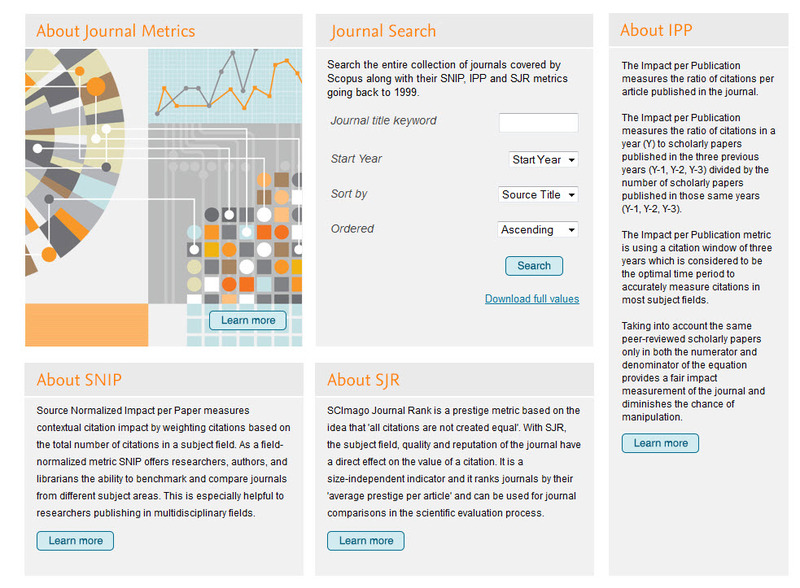 This week, we’re happy to report that the 2014 Journal Metrics values for the Source Normalized Impact per Paper (SNIP), SCImago Journal Rank (SJR) and Impact per Publication (IPP) are now live on Scopus.com. The values have been updated into Scopus for the Compare journals and Browse Sources pages, as well as on the Public Title List that is available on the Scopus info site. The new data provides 2014 citation performance metrics for 22,639 serials in all subjects in science, social sciences and the arts and humanities. We have some great news to share on the Scopus front! QS, a global leader in university rankings, and Elsevier today announced their decision to renew their long-term collaboration. As part of the agreement, QS will continue to use Scopus data for its flagship World University Ranking, QS Top 50 Under 50, QS University Rankings for Asia, BRICs and Latin America. This is truly an endorsement of the work team Scopus has done over the last 11 years – improving the quality of the Scopus database with a focus on increasing the breadth and depth of globally relevant coverage. Want to learn more about more about how Scopus is is improving? Check out these posts on how we are expanding historical and books coverage and read more about updates to our user interface. We’re pleased to announce that the 2014 journal metrics values are now freely available via JournalMetrics.com. The values will be visible in Scopus.com as of our next release which is scheduled for June 24, 2015. It's impossible for one metric to serve all the necessary purposes – a mix of quantitative and qualitative evaluation is needed. When evaluating the performance of a journal, a variety of measures must be considered, of which citation analysis is only a part. An ideal “basket of metrics” contains measures that reflect the many ways a journal can demonstrate excellence, and, finally, individual assessment of the value of a journal’s contribution will require a mix of quantitative and qualitative evaluation. The next time you search in Scopus, gain more insight into your results by using the <Analyze search results> feature located at the top of your search results page. It provides a visual analysis of your results broken up into 7 categories (year, source, author, affiliation, country/territory, document type and subject area). Begin with a search on "wearable technology"
Your results return a list of over 5,900 publications. To sort through the results quickly, and to find your answer, try clicking on the <Analyze search results> link to find your answer — all in about 30 seconds! 1. The h-index includes citations back to 1970, a result of our Cited Reference Expansion Program. 2. The h-index includes citations from expanded book coverage (but can be easily excluded from your calculation if desired). 3. You can calculate the h-index for a single author, multiple authors or even for selected documents. 4. You can access an h-index from the author details, the analyze author output and the citation overview pages. 5. Author self-citations can be excluded from calculating an h-index. Over the last year the MENA (Middle East and Northern Africa) region has seen very exciting developments in terms of research growth. This was further established at the inaugural Times Higher Education MENA Universities Summit that was recently held in Doha, Qatar. M'hamed Aisati (Director Content & Analytics, Elsevier) was there to talk about Scopus content and the breadth of coverage in the region. 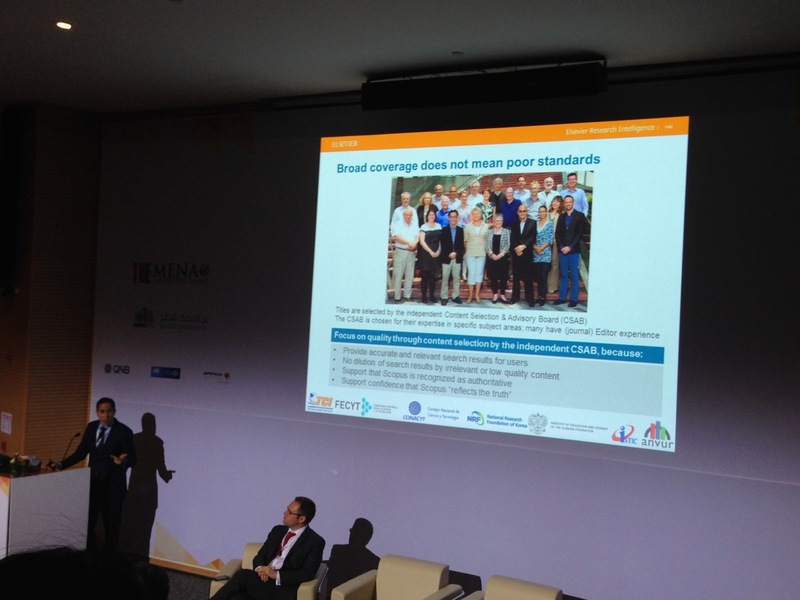 M'hamed’s presentation gave a broad overview of the interdisciplinary scientific information available in Scopus, while stressing the value of research metrics in order to assess efficiently ongoing research and current developments – an area where Scopus plays a key role given its breadth of content and focus on quality through content selection by the independent Content Selection and Advisory Board (CSAB). Drawing on Scopus data, the ground-breaking report Mapping Research and Innovation: Understanding Amsterdam’s Competitive Advantage was released today showing how Amsterdam is building its future on a foundation of research to create a sustainable knowledge economy. Developed by Elsevier Analytical Services in partnership with the Urban Innovation Network, the report explores the importance of aligning research with city development policies and provides a macro picture of Amsterdam’s research base. Using Scopus data and SciVal analytics, the report analyzes the city's competitiveness across multiple dimensions of research performance from 2004-2013. Using Amsterdam as an extended case study, it provides a holistic view of the city’s research strengths and benchmarks its performance against other European cities of comparable size (a.o. We are pleased to announce that the inaugural and recently-released "2015 Best Chinese University Ranking" report, based on evaluation by the ShanghaiRanking Consultancy (SRC), is using Scopus data and metrics from SciVal analytics. A truly exciting start to the Year of the Sheep (as 2015 is referred to by the Chinese zodiac)! The report provides a detailed look at key research performance indicators of more than 1,000 higher education institutions across mainland China. SRC's ranking of Chinese universities offers objective benchmarking of research performance of higher education institutions, allowing research management offices and higher education agencies to make strategic decisions around policy development and investments towards building the research capabilities of these universities.